With the new iPad out and tantalizing games like Epic’s Infinity Blade Dungeons on the horizon, Apple’s iOS devices are finally showing their competitive mettle as powerful gaming machines. Still the iPad and iPhone are missing out on many of video games’ biggest names. Add one more major developer to the pile: Elder Scrolls V: Skyrim and Fallout 3 maker Bethesda Game Studios is coming to iOS. A job listing calling for an iOS programmer recently appeared on Bethesda parent company ZeniMax’s careers website. The company is looking for an experienced iOS developer with familiarity of Bethesda’s games. A voracious appetite for Apple’s wares is also seemingly a requirement as the idea candidate also “follows live blogs of every Apple event” according to the listing. Unfortunately for Bethesda obsessives, the listing provides no details on which of the company’s properties may be coming to Apple’s handhelds or when. Given the processing and graphical power inside the third-generation iPad, older titles like The Elder Scrolls IV: Oblivion and Fallout 3 could potentially be converted for the platforms. 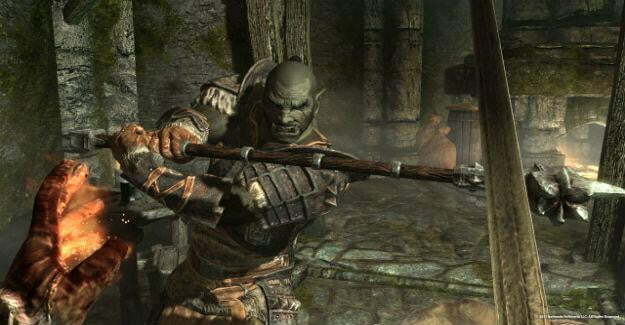 It is also possible that iOS will be the platform of choice for Bethesda’s rumored Elder Scrolls MMO. A rumor originating at Tom’s Guide began circling the web on Mar. 15, claiming that the studio would unveil an online version of its popular fantasy game in May. The unnamed source cited in the original report claimed that the MMO will include three factions for players to join, each represented respectively by a dragon, bird, and lion. The MMO will also take place 1000 years before last year’s Skyrim.